and perfect for all ages! - Rods, reel, and tackle provided for FREE! 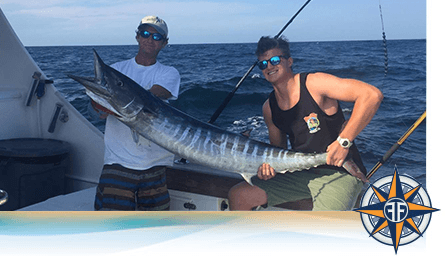 The Outer Banks, NC also referred to as ‘the Billfish Capital of the World’, offers some of the world’s finest OBX sportfishing and the most preferred game fish. Treat yourself to an on the water experience by reeling in yellowfin tuna, dolphin (mahi-mahi), wahoo, marlin, sailfish, and bluefin tuna. The Fishin Fannatic is a 53’ Viking Sportfish. This OBX fishing machine is fully rigged for sportfishing on the outside but hosts all the comforts of home on the inside. 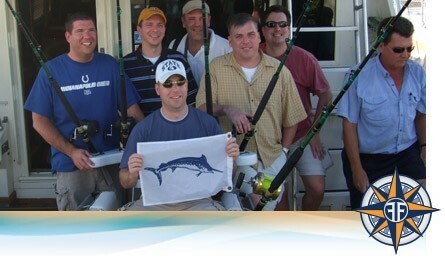 Plus we are proud to offer an unmatchable Outer Banks fishing trip experience with Captain Mark and his seasoned crew! With over 38 years of fishing experience, Capt. Mark is a highly skilled angler and takes pride in his profession – which you will see first hand when you get out on the water with him. Capt. Mark enjoys putting customers on the fish – from the skilled angler to the new customers just trying to enjoy a day on the water. Being a family man himself, Capt. 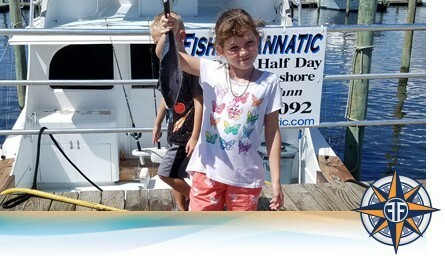 Mark enjoys having the kids onboard the Fishin Fannatic, making memories that will last a lifetime. Here on the Fishin Fannatic, fishing is not just our job, it is our true passion. No need to wait! Book an affordable OBX fishing trip online now. CHECK OUT THE FUN!CHECK OUT THE FUN! Our boat, the Fishin’ Fannatic, is a 53’ Viking Sportfish that is equipped with a large cockpit, fighting chair, and air conditioning. Captain Mark has over 38 years of fishing knowledge and experience fishing all across the East Coast so you know you’re in good hands. 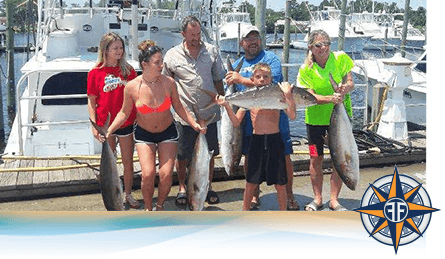 Our expert Outer Banks fishing captain and crew make your happiness our top priority and will go the extra mile to ensure you’re taken care of in the OBX. There’s no better way to create memories with the family then going fishing! 1/2 Day Nearshore Trips in the OBX are an ideal option for groups with kids or for beginners. This is a great way to quickly get out on the water and enjoy your time fishing. One of the largest nearshore boats available, our new 53’ Viking Sportfish is nothing like you have experienced before. 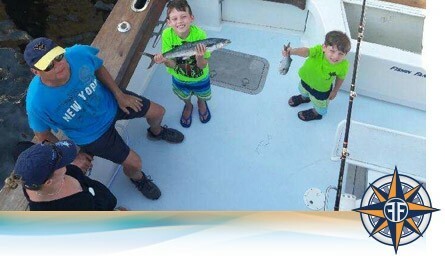 Our OBX fishing charters are safe, stress-free, and perfect for all ages. 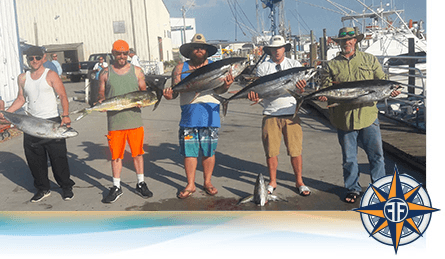 Nearshore fishing charters are a great way to experience high-quality sportsfishing in the Outer Banks while staying close to shore. 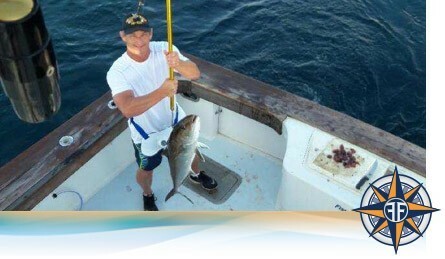 We accommodate any skill level or fishing style while offering half and ¾ day excursions. Depending on the fishing season, you can expect to run into several tasty fish like cobia, Spanish mackerel, or bluefish. One of the largest nearshore boats available, our new 53’ Viking Sportfish is nothing like you have experienced before. We provide fishing licenses, bait, and tackle, so all you need to bring is your lunch and some sunscreen! Great fishing trip for younger kids! Those looking for a huge catch should book an Offshore OBX Fishing Charter. Anglers, beginner or pro, can look forward to an entire day of adventure on the Outerbanks 30 to 40 miles offshore. Whether we are trolling, kite fishing or using the “Green Stick”, the action is incredible. There is nothing like seeing a tuna come out of the water and hit the bait. Full day trips depart at 4:30 AM and return at approximately 4 PM. take you over an hour out where you can find the big catches like Tuna, Mahi Mahi, Billfish, and Wahoo. On the ride out to the fishing grounds, the Fishin Fannatic has a beautiful air-conditioned cabin or plenty of room on the bridge to hang out and take in all the sights. All of your fishing gear is provided free of charge but be sure to bring a cooler with your own food, drinks, and sunscreen! Gather up your family and friends and enjoy a 6-hour extended fishing trip. On this trip, we have the availability to troll further than we would on a half day trip. We have had mahi-mahi, king mackerel, little tunny, wahoo, and an occasional billfish caught on this trip. One of the largest nearshore boats available, our new 53’ Viking Sportfish is nothing like you have experienced before. You never know what the fish Gods are going to give you. All bait, tackle, and licenses are provided by the Fishin’ Fannatic, and up to 6 people can join in on the fun! Ready to treat yourself to a great offshore challenge? Our daytime swordfish trip may be just what you’re looking for. Swordfish, also called Gladiator of the Sea, is one the most elusive and sought after gamefish. As the sun rises, the swordfish heads deep, following their favorite prey, the squid. During the evening, the squid migrates up near the surface and then return to the deep as it gets light. In the daytime, swordfish usually are very deep, 1500 feet or more. We target these fish in the daytime with a variety of baits and a 12-16 lb “breakaway brick” weight to get to the bottom. The bite usually appears as a very subtle movement on the rod tip. The swordfish is not your ordinary billfish. He uses his powerful bill to “whack” his prey, sometimes over and over again, to kill it before eating it. Once on, it is an incredible fight that can challenge even the most experienced angler. Nighttime swordfish trips are also available, please call for availability and reservation. For those looking for the “Ultimate Adventure”! Our overnight trip is a great combination. We leave the dock at noon and head out to catch the late afternoon bite. Once the sun goes down, we set up for nighttime swordfishing and “chunking” for tuna. As the sun rises, we target the morning bite and arrive back at the dock around noon. This is a great trip for escaping the summer heat and catching a wide variety of fish that the Outer Banks has to offer.